While many patients shy away from dental implants due to the cost, an implant-retained restoration will likely save you money in the long run. Traditional tooth replacement options like fixed bridges and dentures need to be replaced every five to seven years on average. Implant supported bridges and dentures can last for decades with proper care. You know that sagging wrinkled face that jumps to mind when you think of dentures? Dental implant supported partial and full dentures can actually help patients avoid this cosmetic impact and keep their face and smile looking young and healthy. Without stimulation from tooth roots, gum tissue volume and jawbone density diminish over time allowing the face to cave in and appear sunken and saggy, but dental implants mimic the natural function of tooth roots, leaving patients with youthful, healthy smiles. 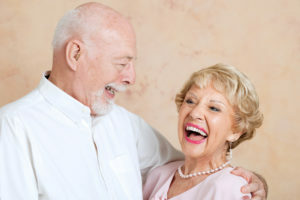 Traditional dentures only replace about 20% of healthy chewing ability. Implant retained dentures can restore 70% or more natural chewing range. This is due to the replacement of both the tooth roots and the crowns of teeth, which makes dental implant supported tooth replacements look, feel, and function just like the teeth you lost. Dental implants are fixed, so you can brush them just like your real teeth. Even the removable implant retained dentures can be brushed before or after they’re removed. Many patients find this much more convenient than trying to brush a full or partial denture while holding it outside of the mouth. Some patients are also embarrassed of the thought of being caught at night without their teeth. This is never an issue with dental implant supported prosthetics. Due to the long lasting, oral health improving, natural looking and feeling results, dental implant supported restorations are considered the gold standard in tooth replacement solutions. More and more dentists are encouraging patients to at least consider the benefits of dental implants. Even more importantly, innovations in dental implant technology means that more patients than ever are able to successfully receive dental implant supported restorations. At Chambers Family Dentistry, our caring Annapolis dentist and team love to use dental implants to provide the ultimate stability and longevity for tooth replacement prosthetics. If you would like to learn more about dental implants and whether or not they are the right option to meet your needs, contact us to schedule a consultation with our knowledgable team. We’ll be happy to walk you through all of your treatment options and partner with you to create a personalized restorative dentistry plan that will put a smile on your face.